Published 30 September 2016 under Performances. Human rights issues, such as inequality, poverty, race, gender, disability, and discrimination, have been thrusted into the recent public spotlight, allowing an opportunity to confront the structural inequalities which exist in contemporary post-apartheid South African society. Continuing this narrative, arepp:Theatre for Life piloted the Look Before You Leap: Being Right project, an Applied Theatre presentation which positively engages young adults in order to encourage acceptance of diversity and foster commitment to the values and principles entrenched in the South African Constitution. 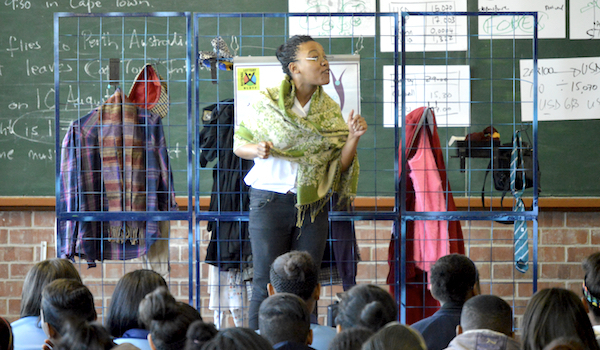 Thanks to the support of the National Lottery Distribution Trust Fund (NLDTF), arepp:Theatre for Life was able to reach 4,500 13 to 16 year old school-going youth in the Western Cape Metro education disctrics, developing Life-skills and Self-efficacy in relation to democracy, human rights, and discrimination. To read more about the new Look Before You Leap: Being Right project, click here.